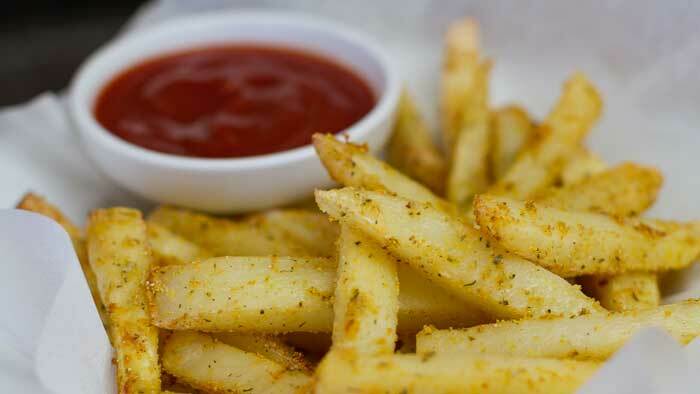 Crispy seasoned oven fries without oil! This is what healthy comfort food is all about. These taste absolutely delicious and will make you think that you are having a naughty treat – but they are actually good for you 😉 Happy days! Preheat oven to 180 degrees Celsius or 360 degrees Fahrenheit. Peel and wash your potatoes and cut into even small finger sized shapes (see video for demonstration). Add all remaining ingredients and mix together well - preferably by hand so that the fries get coated evenly. Place on a baking tray with non-stick parchment paper or on an oven grill tray to allow air to circulate more around the outside of the fries during the cooking process. Either way is fine. Place in oven for 10 minutes then remove and turn the fries over. Place back in oven for another 15 minutes or until desired crispness is reached. Serve and enjoy with vegan mayonnaise, ketchup, mustard, pesto, sweet chili sauce, gravy etc. Anja, I love your recipes and this one caught my eye, as we were bbqing burgers. I cook for. 8 priests. I followed your recipe exactly. Unfortunately, the fries were undercooked and dry. I cooked them at 360f for 35 minutes. Not crispy. Disappointing. Oh no, not sure why they didn’t turn out for you. The only thing I can think of is that maybe they were cut thicker than mine??? As usual, you’ve done it again, thanks! The only issue I have with this is my (wonderful) husband is allergic to corn so the Polenta/corn meal is a problem. I’m guessing I can trade out the corn starch for arrow root, do you agree? If yes, can you give me a suggestion for replacing the corn meal? If no, would you please suggest an alternative for the corn starch also. I was viewing your no oil seasoned oven fries which looked absolutely lovely. Can you tell me the brand of your broiler pan with rack insert. I would like to purchase one. I am looking forward to making your fries. Thanks! The narrator in the video said “Pour 2 Tbsp. of OIL over the potatoes”. Yet the title of this video reads “No OIL seasoned fries”. No mention of oil in the video or the recipe. This is oil-free! I notice that you always use white pepper, any reason why you don’t use black pepper? I just like the taste of it and it is a little bit sweeter than black pepper. Do these fries really need to be flipped over? I thought maybe because they were on the baking rack they would cook all over more evenly….I’m always looking for the easiest way to cook! 🙂 Thank you. I love your recipes! It allows for more even crispiness by turning them because they are oil free. My oven was a little off and so I had to bake them a wee bit longer. Dipping them into a vegan mayo and ketchup was truly delightful! Another successful recipes, thank you! Will it work with sweet potatoes? I have tried but without oil they tend to burn. These look amazing and I can’t wait to try them, but I really don’t think the Prep Time is very realistic. It is virtually impossible to prepare them in 5 minutes. It would take at least 15, considering you have to gather the ingredients, wash, peel and cut the potatoes, measure everything out, etc. And I’m not even counting cleaning time. I know it would take me about 25 minutes instead of 5. Plus oven time. So excited to see this oil free recipe but like another writer, I’m allergic to corn. On top of that, I’m gluten sensitive, so cannot use the “Wheaties style cereal crushed up in place of the corn meal”. Would you happen to have any other suggestions to replace that? Thanks for your help. You could possibly try some gluten free bread crumbs. Can I substitute rice or oat flour for the corn meal and corn starch? I love your recipes! My husband has RA and we have been following Dr. McDougalls diet but looking for more variety. I have lost 30 pounds and still need to lose 40 more, just trying to implement your recipes with what he advises we eat. Thank you for all the wonderful ideas! This is an awesome recipe and it is accurate. Not sure where the negative comments are coming from. We follow Dr McDougal’s diet as well and these taste great! Agree it’s a lil more than 5 min prep time but overall it’s spot on so thanks for your time putting this recipe together and posting it!